I hinted that there would be a slight shift in focus for October’s MIY Makers and here it is, in celebration of #slowfashionoctober and all things sustainable sewing I want to celebrate your Most Worn Makes for this month in #MIYmostworn. 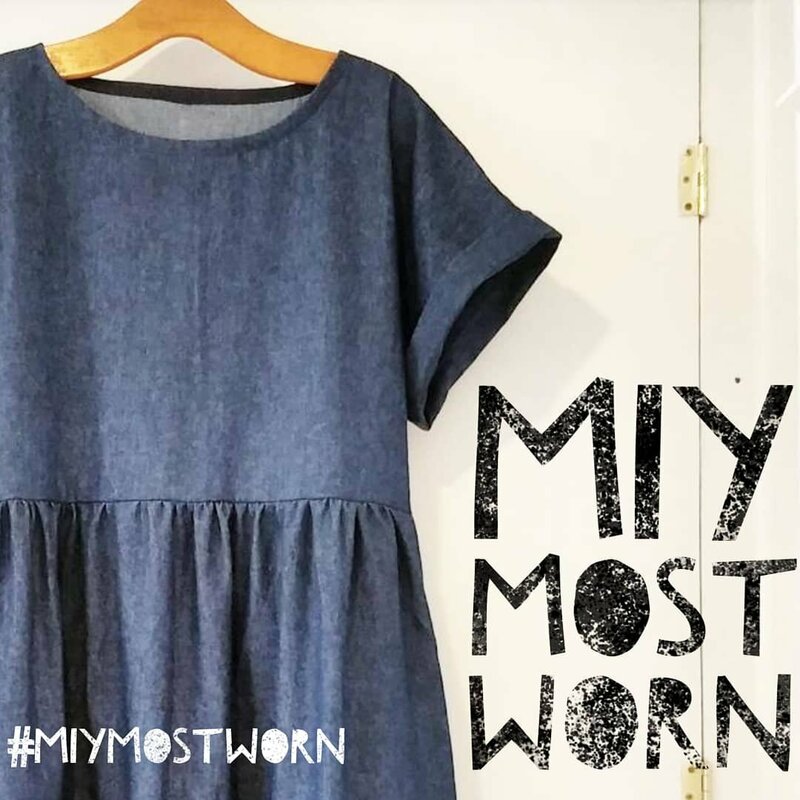 It’s just as easy as the regular MIY Makers to take part, just share a picture on Instagram of your most worn makes from my patterns or books, tag me and use the hashtags #MIYmostworn and #mostwornmakes. Let’s celebrate those makes that you reach for again and again. 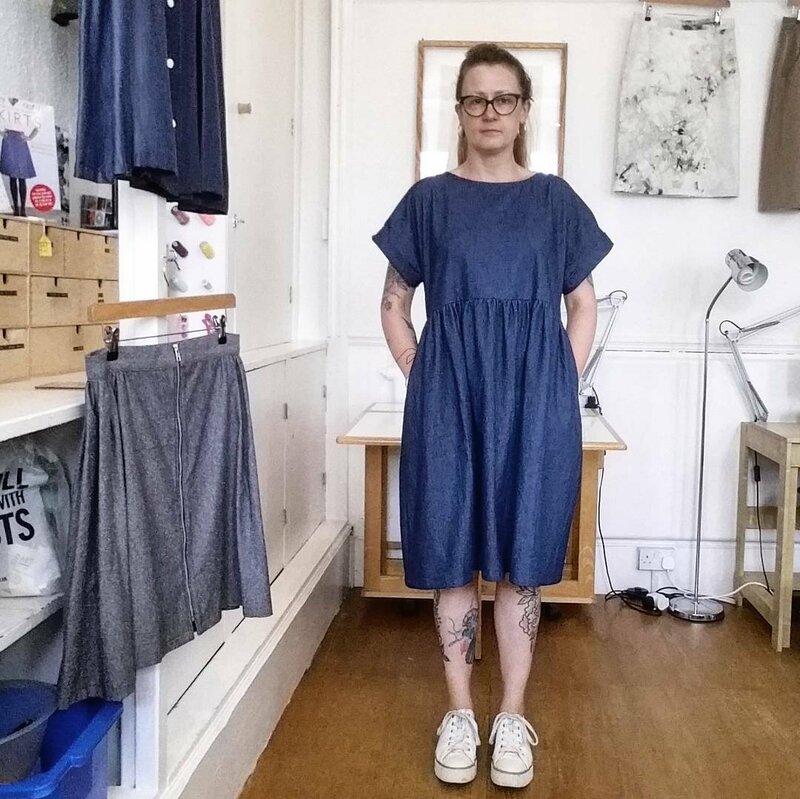 To kick off, here’s one of mine – my denim Fulwood dress, worn on its own all summer and great for layering with long sleeved tops and leggings at this time of year. I liked it so much I made these pictures of it too! What’s so important about our Most Worn Makes? If you’re not sure what Slow Fashion October is all about, in a nutshell it’s a month long celebration of everything that is the opposite of fast fashion. It’s organised by Karen Templer and you can find out more about it on her blog and by following @slowfashionoctober on Instagram. I’ve also written about it in previous years here. Thankfully, wider society is gradually becoming aware of these issues thanks to some hard hitting films and documentaries such as The True Cost and if you didn’t catch it earlier this week, there was a brilliant documentary on BBC1 with Stacey Dooley called Fashion’s Dirty Secrets. If you thought that the main environmental problem caused by the fashion industry was plastic pollution, think again. The thing that is MOST relevant about this film to us as makers is that most of the pollution highlighted is generated at the fabric production and processing stage of garment manufacturing. So yes, that means that when we share our “hauls” of fabric purchases and gloat guilt-free about the size of our fabric stashes, we are contributing to these problems and, in my opinion, those habits and attitudes are equally as destructive of those bloggers and vloggers gleefully posting their “hauls” of fast fashion purchases. Kate of Time to Sew blog also writes extensively about sustainability and has a month-long challenge for October: Slow Fashion Styling, designed to encourage us to take a fresh look at some of the less worn pieces that we all have loitering at the back of our wardrobes. I hope you’ll take up some of the challenges, get creative, be inspired and most importantly (if you don’t already), start to think about the longevity or “price per wear” of your makes. This entry was posted in MIY Makers, Sustainable Sewing and tagged environmental impact of fashion, fast fashion, MIY Makers, miymostworn, most worn makes, slow fashion, slow fashion october, sustainable fabric, sustainable fashion, Sustainable Sewing, thoughtful sewing, true cost film, Wendy Ward. Bookmark the permalink. Retired & have some physical limitations. Been “shopping” in my closet. The old dresses have superior fabric and construction. People actually notice! I probably couldn’t afford to take up sewing again. Can’t get my head around how expensive cottons are these days!